I get a lot of questions about navigating buffet style eating and any type of cafeteria or dining hall. Here are some great, easy ways to handle those situations, and what to order at different stations. Definitely leave me a comment at the bottom of this blog post if I missed anything! Here are some EASY New Years resolutions that you can seamlessly include in your life. If you’re following along with me and sticking with 1 starch and 1 fruit per day, think about what type of meal you’d like this to be, in relation to the other meals and snacks of your day. For example: If you know you’re going out for pizza or pasta tonight, can you stick with a meal of protein, vegetable, and fat at the cafeteria? Another example: If you know you’re going to be eating soon after this meal, let’s say an early lunch and this is breakfast time, can this meal be a bit smaller to account for that? There’s nothing worse than “buyer’s remorse!” - or should we say “orderer’s remorse” haha. Look around the cafeteria and see what exactly is being offered at each station. This way, you’ll also save money and wasted food this way; let’s all do our part with looking out for the planet! That being said, my grandma used to say: “It’s better to waste food in the trash than inside your body.” I would never want someone to eat just because the food is there. Worse comes to worse, take the food home with you to have the next day, freeze, or give to someone in need. Keeping health, budget, and taste buds in mind are all important. Do the vegetables at the salad bar look fresh or old? Does the soup station have a filling, low-carb option since it’s cold out and this would be comforting? Does the “home” station have my favorite vegetable side dish? However! I definitely would not want you to eat something you’re not enjoying. Eating should always be a pleasurable experience. As I said above, as my grandma used to say: “It’s better to waste food in the trash than inside your body.” Give yourself some trial & error time to figure out what works best for you. Step 5. Leave When You’re Done - Don’t Linger! While it’s true that one of my most enjoyable memories of college was staying for hours in the dining hall hanging out with friends, as it was one the main “hang out” places, it did not suit my waistline very well at all! Instead of hanging out in the dining hall, where it is TOO tempting to snack and munch mindlessly, leave and take the party somewhere else! You’ll thank yourself later. As you probably already know, I do subscribe to a low-carb approach. Not a no-carb approach, not keto or anything extreme, but I do strongly believe, and read that the research is strongest to support, that a lower carbohydrate approach to eating is healthier for your body and brain. Therefore, the options listed below have the low carbohydrate approach in mind. Of course please feel free to customize based on your specific needs and likes! 100-200 calories of fats - e.g. nuts, cheese, avocado, olives, bacon, etc. Before we move on - 1 note about veggies in salads. I will say that 2 cups of greens = 1 cup of veggies because there's so much air in there. Therefore, for salads, it's really 3 cups of veggies, because you have the 2 cups of greens, and then you have 1 cup of additional vegetables. For the base of a salad, choose 2 cups of any green you like - mixed greens, romaine, butter lettuce, arugula, etc. Change it up week to week so you get a variety of benefits, but other than that, choose what you like! Now, add 1 more cup of non-starchy veggies. The good news is that for many veggies, just choose 1 veggie and chop it up - that's about a cup! No more "half a tomato here, half a bell pepper there". Come on, who has time for that?? And now for adding delicious fats! A note on salad dressings: I recommend sticking with 1 Tbsp of regular salad dressing (any type - oil or creamy), or 2 Tbsp of light dressing like fat free Italian. I love the taste of dressings, but they’re often not worth the calories. I actually find the grill to be one of the easiest places to make a good choice! Make an open-faced sandwich with one piece of toasted, whole grain bread. Here are some ideas! Veggies: 2 cups (typically scoops!) of collard greens, spinach salad, roasted broccoli, etc. In terms of fats from my formula, fats are typically cooked into meals that are already prepared (like butter, oils), so you don’t generally need to worry about adding them in. Take 1 slice of pizza with a side of veggies from the salad bar (see ideas above), and another side of meatballs if available & if you’re hungry! 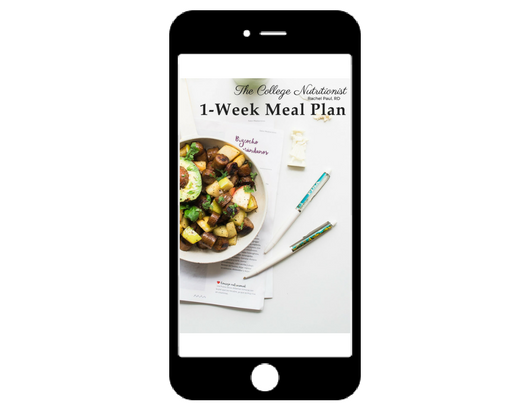 If you are looking for the EASIEST and most realistic weight loss program - that works for the LONG term (it incorporates weekly meal plans, how to stop stress & boredom eating, AND an accountability group) - check out my program HERE!